Well! Sorry to be away from the blog for a couple weeks. Will update now quickly and add to this when I have time later in the week. They are doing well, it appears. Just to update quickly. 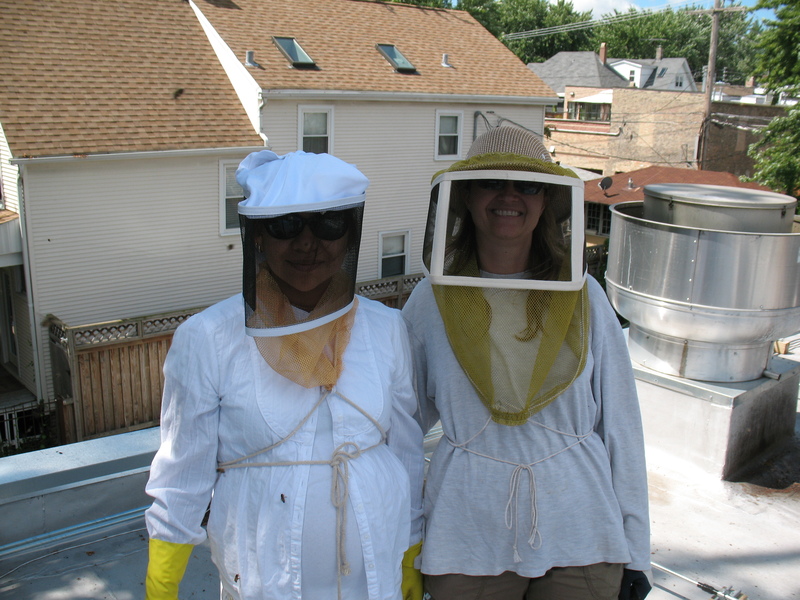 One June 8, Helen and I added the second hive body on North, which was starting to have a few drone cells and a couple queen cells, though no active ones. South had almost completely filled out the lower hive body, and had a few queen cells, but perhaps one active one. 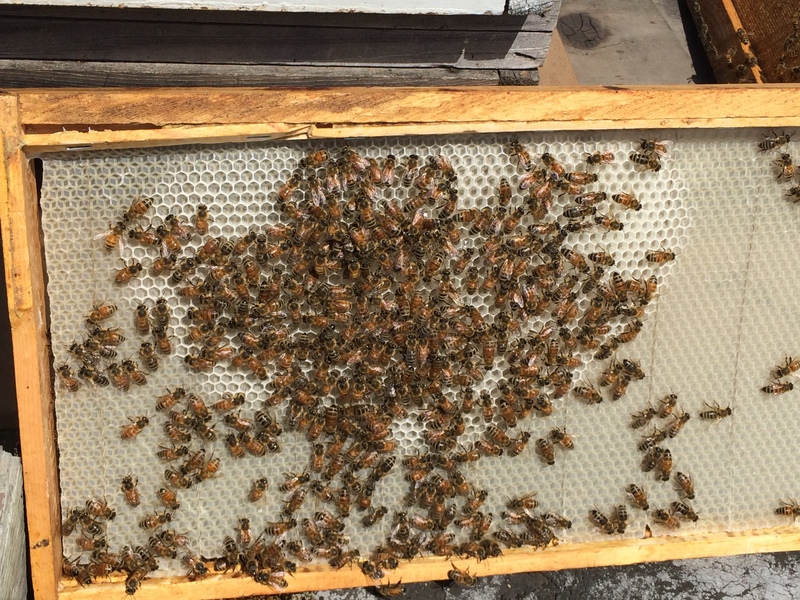 They are both gathering tons of pollen and nectar, and starting to cap honey at the tops of the frames. On June 8, my friend Ziggy came along and watched us tend to the hives, making him our first visitor beyond Joe, my old roommate, Ann, and Mike as we checked them. On June 14, I checked them later in the afternoon as Ann and Milo went to the grocery story. It took me a while to go through both hives. 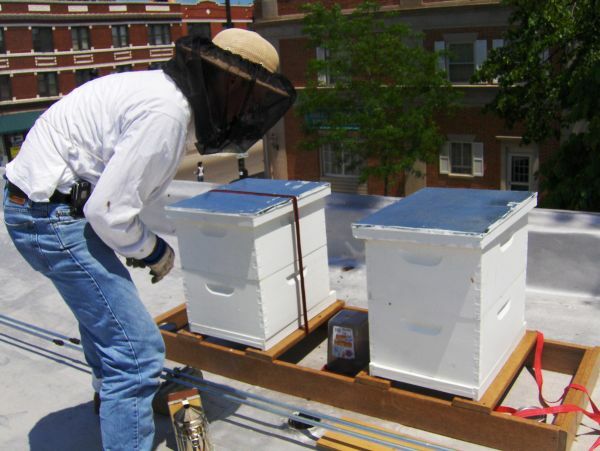 South actually had done almost nothing on the upper hive body, and while the queen is still laying well, everything’s packed in so tight that the bees are story honey where they shouldn’t, and have pollen packed in everywhere on the few frames dedicated largely to honey storage. (See photo below for nectar and pollen stored where there should be brood.) 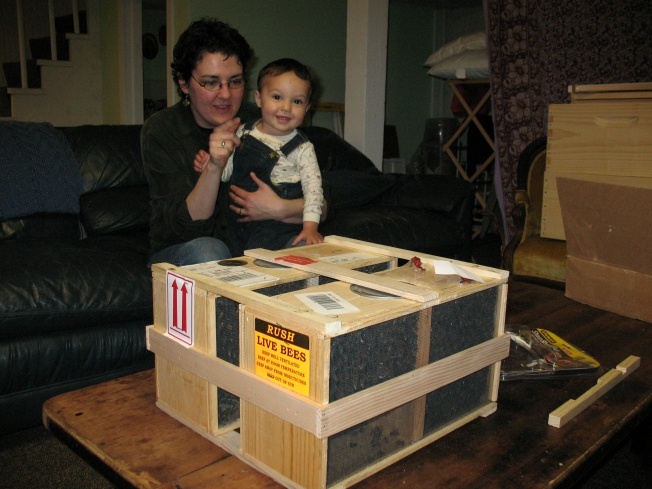 I’d tried putting some sugar water on the frames in the upper hive body on June 8, but that didn’t entice them up by the 14th. So I took one of the honey frames and placed it in the upper hive body. Perhaps that will do the trick. 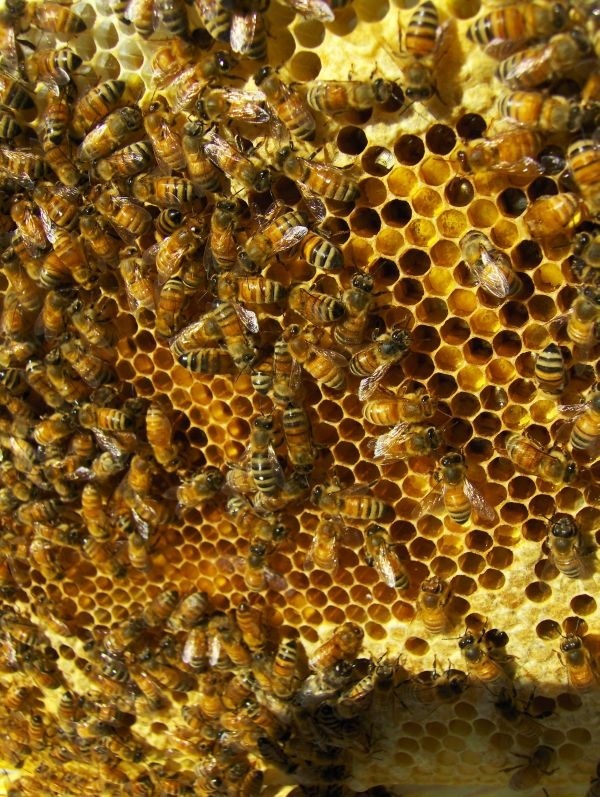 North actually had three frames drawn out in the upper hive body, and lots and lots of burr comb between the two hive bodies, much of it filled with uncapped honey. So I scraped that. Possibly because of the better honey storage, North now seems to be moving along more swiftly than South. Although South still has more bees, North has a couple more frames of brood ready to hatch. As I was finishing up on North, Ann and Milo came up and watched me from the deck, about 30 feet away. Milo fussed a little because he couldn’t come see me in my bee gear, so I brought over some of the burr comb with honey. His first! You’re not supposed to give raw honey to babies because of the (remote but still possible) chance of botulism. He grinned with delight. 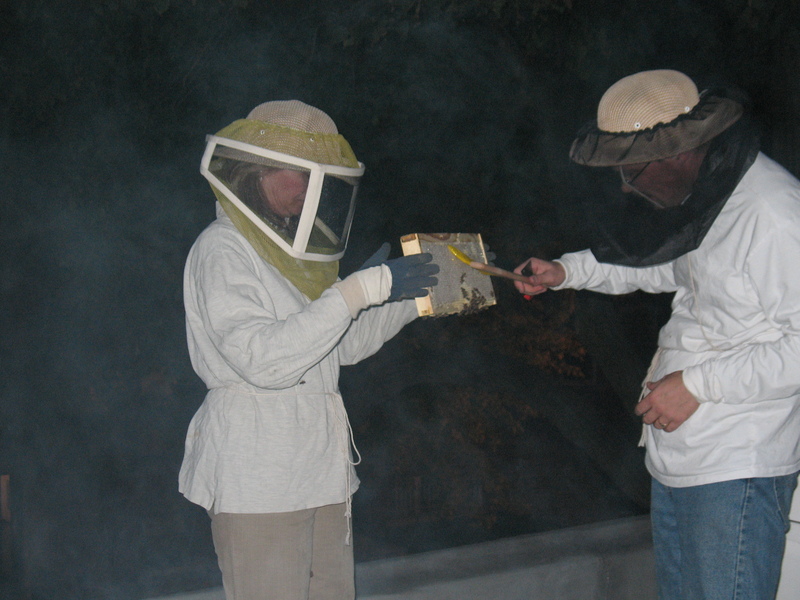 As we gave some to him, Hugh, one of the chefs at the restaurant, came up to the deck, so we gave him some honey also. It was very light–being uncapped, it was more watery than honey usually is when people have it. The bees were still reducing its water content. More later, along with many new photos–and our first video!